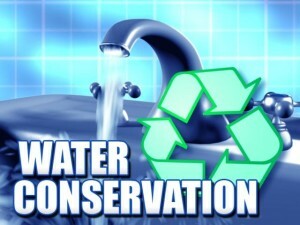 Water is our most precious natural resource, yet every day American’s waste millions of gallons. Why? Because we don’t really think about it. Turn on the faucet and water comes out. Experts are predicting that in the years to come, the cost of turning on that faucet will continue to rise as does demand. Here are just a few ways that you can help reduce demand and help keep prices low. Never pour water down the drain when there may be another use for it. Use it to water you indoor plants or garden. Install a water softening system only when the minerals in the water would damage your pipes. Turn the softener off while on vacation. Choose appliances that are “Water Star” rated as more energy and water efficient. Consider purchasing a low-volume toilet that uses less than half the water of older models. Place a one-gallon plastic jug of water into the tank to displace toilet flow (do not use a brick, it may dissolve and loose pieces may cause damage to the internal parts). Be sure installation does not interfere with the operating parts. Avoid taking baths – take short showers – turn on water only to get wet and lather and then again to rinse off. Hand wash dishes by filling two containers – one with soapy water and the other with rinse water containing a small amount of bleach. Start a compost pile as an alternate method of disposing of food waste or simply dispose of food in the garbage (Kitchen sink disposals require a lot of water to operate properly). Avoid wasting water waiting for it to get hot. Capture it for other uses such as plant watering or heat it on the stove or in the microwave. Avoid rising dishes before placing them in the dishwasher. Just remove large particles of food. (Most dishwashers can clean soiled dishes very well, so dishes do not have to be rinsed before washing). Plant native and /or drought-tolerant grasses, ground covers, shrubs, and trees. Once established, they do not need water as frequently and usually will survive a dry period without watering. Small plants require less water to become established. Group plants together based on similar water needs. Use a commercial car wash that recycles water. If you wash your own car, park on the grass so that you will be watering at the same time. Position sprinkler systems and timing devices regularly to be sure they operate properly.